Buy Moo Free Dairy Free, Gluten Free Chocolate Baking Drops - 150g in the UK from our online shop or directly from our independent Scottish store. If you want to automatically receive an email when 'Dairy Free Chocolate Drops' is back in stock, just leave your email address below. Delicious Dairy and Gluten Free Chocolate Drops to use for baking. Suitable Vegans and Vegetarians. Ideal as a treat or just a snack for chocolate lovers. Ideal for baking with or as a snack. Each bag is filled with 150g of dairy free, gluten free, soya free and vegan chocolate drops which are perfect for adding to cookie recipes, chocolate muffins, cup cakes, chocolate cakes or cooking other chocolate recipes with. Moo Free cooking chocolate contains 45% organic cocoa and is made using Moo Free's multi-award winning dairy free, gluten free, soya free and vegan chocolate recipe. As official Moo Free stockist, we sell genuine Baking Sundries directly from our shop in Scotland and online throughout the UK. Moo Free is a world leading manufacturer of dairy free, gluten free, organic and vegan chocolates that actually taste like milk chocolate. View more products from Moo Free. Where can you buy real Dairy Free Chocolate Drops safely online? 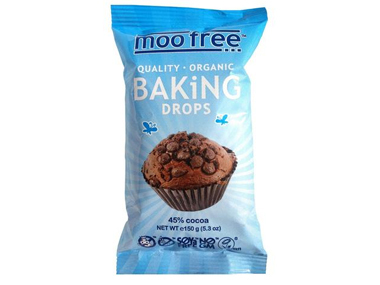 If you are wondering where you can buy Moo Free Dairy Free, Gluten Free Chocolate Baking Drops - 150g safely online in the UK, then shop with us. We are an actual health foods shop; with real people selling real foods and products. Our award-winning independent shop is located in Stirling, Scotland since 1976. You can buy our Diary free chocolates, bars and advent calendars and other genuine Baking Sundries in store or safely place an order with us online or over the phone. Dairy Free Chocolate Drops - Moo Free Dairy Free, Gluten Free Chocolate Baking Drops - 150g in Baking Sundries and Baking.